Line sheet pan with a piece of parchment paper. Lightly spray with nonstick cooking spray and set aside. Prepare brownie mix according to package directions. Pour batter into pan. Bake 30 minutes, or until wooden pick inserted in center comes out with moist crumbs attached. Remove from oven to cooling rack, and cool for 20 minutes or until slightly warm. Meanwhile, cut straight ends of candy canes off to form 4½-inch sticks. Place candy cane tops into resealable plastic bag, and crush into small pieces. Set aside. Roll brownie into 24 smooth balls. You can use a coffee scoop or something like that to make them the same size. (I didn’t have a coffee scoop, so I just eyeballed it. As with my homemade candy canes, these are like snowflakes. Every one is different!) Then, insert candy cane sticks into centers of balls, mounding brownie around each stick. Place almond bark into small bowl. Microwave according to package directions until smooth. (The microwave method didn’t work out so well for me, so I used the stove-top directions the second time around. Worked like a charm!) Spoon melted bark evenly over each ball, turning to coat completely. Allow excess bark to drip off. Dip into reserved crushed candy canes or jimmies, and stand upright on a piece of parchment paper. Repeat with remaining almond bark, lollipops and crushed candy. Let stand until set. You can place into miniature cupcake liners and wrap lollipops in cellophane, tie with ribbon and use as table décor, place cards, or take-home goodies for a special holiday touch. Yields 24 servings. After eating the brownie, may I suggest enjoying the candy cane as much as Leon and Jase. There wasn’t anything festive or jolly about this season. wasn’t the only one on the planet who hated Christmas. 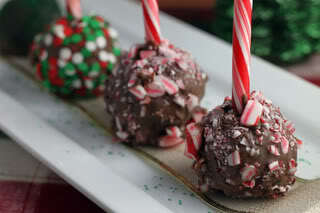 OMG Those candy cane brownie lolipops look so good! And we’re off! Love Jase already. ;D But, he does need someone special to ward off such Christmas blues. Looking forward to this read, hon! And…the candy cane brownies look scrumptious!! Unfortunately, I don’t have an oven and can’t afford to buy a toaster over at this point in my finances. I will, however, copy and paste the recipe and store it for future. Question, though, where does one buy parchment paper? Is wax paper a good alternative?